This month's challenge is the Scaredy Cat paper pack brought to you by the new Annual Inspirations Catalogue, hand picked from Nancy Klein. 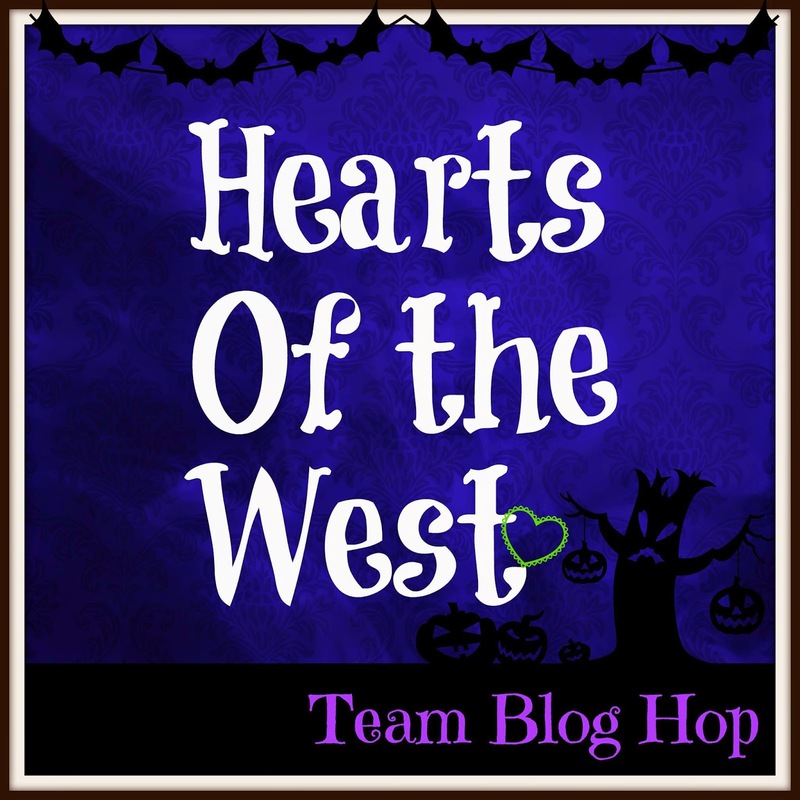 If you came from Donna's Blog then you're in the right place. 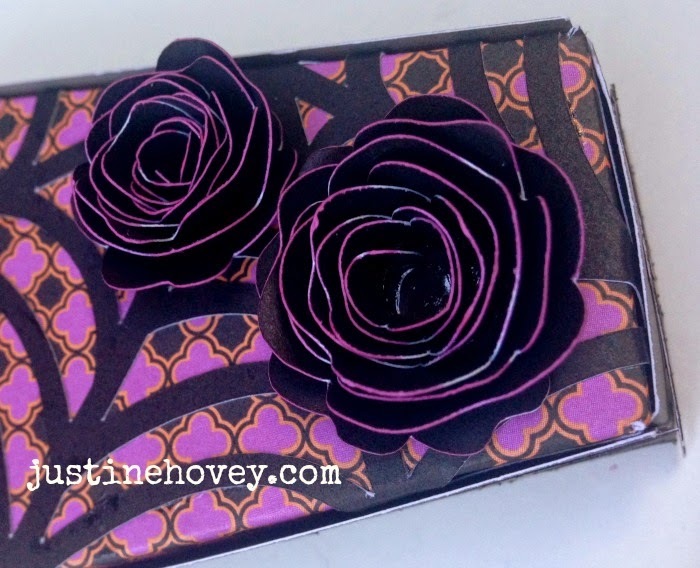 This is a go around blog hop so you can start anywhere! Just in case, the full list will be at the bottom. So, as always, grab your coffee, tea, water, relax, and hop around the team with us. I always have those special kids that I know really well that I want to do something extra special for. This box took me about 10 minutes to make after I finished designing it. I even took all the guesswork out for you and I'm giving you access to my Cricut Design Space File for all you Explore users out there! (keep reading for link). This is 100% cut out using the Cricut Artiste file (all links to products are also available below). 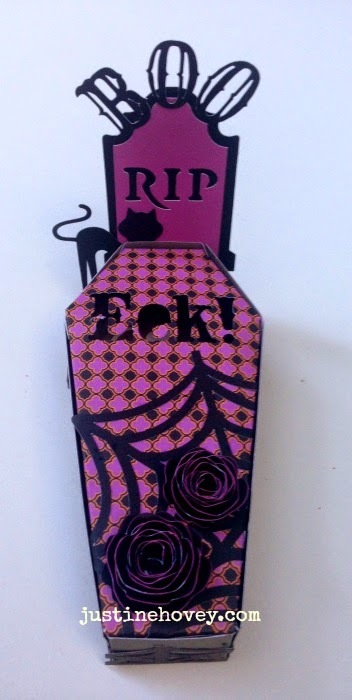 The coffin, cat, grave, BOO, spider web, flowers and web borders. Here is a look at the flowers. I show you in the video how to make them - they are soooo easy! I also have a video here that shows you step by step. I just glued this on the back of the box to make it extra special. If those special guests and going door to door with pillow cases you may want to leave this step out. I even added a little skeleton for a surprise when they finish he candy - isn't he cute! 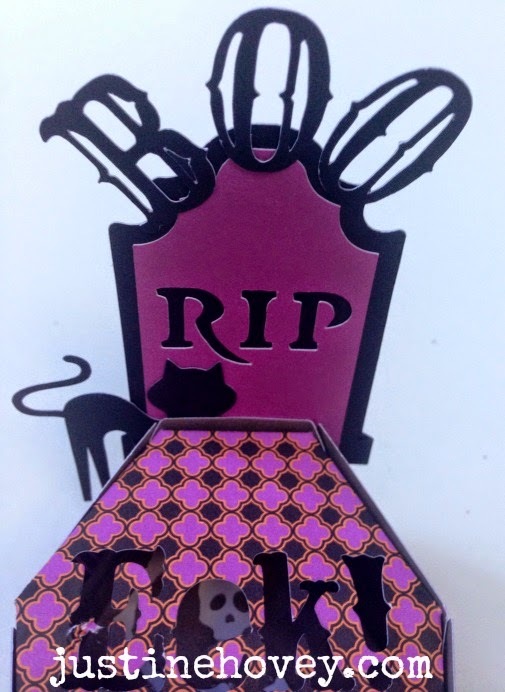 If you are using a Cricut Explore with Design Space, feel free to use my cutting file - If you want the top of the box to fit over the top of the bottom box you will need to adjust the tombstone box. My version - the top fits inside the bottom. Your next stop is Jackie's Blog. What a spooktacular Halloween Gift Box. I especially love the flowers. Cute, cute, cute! 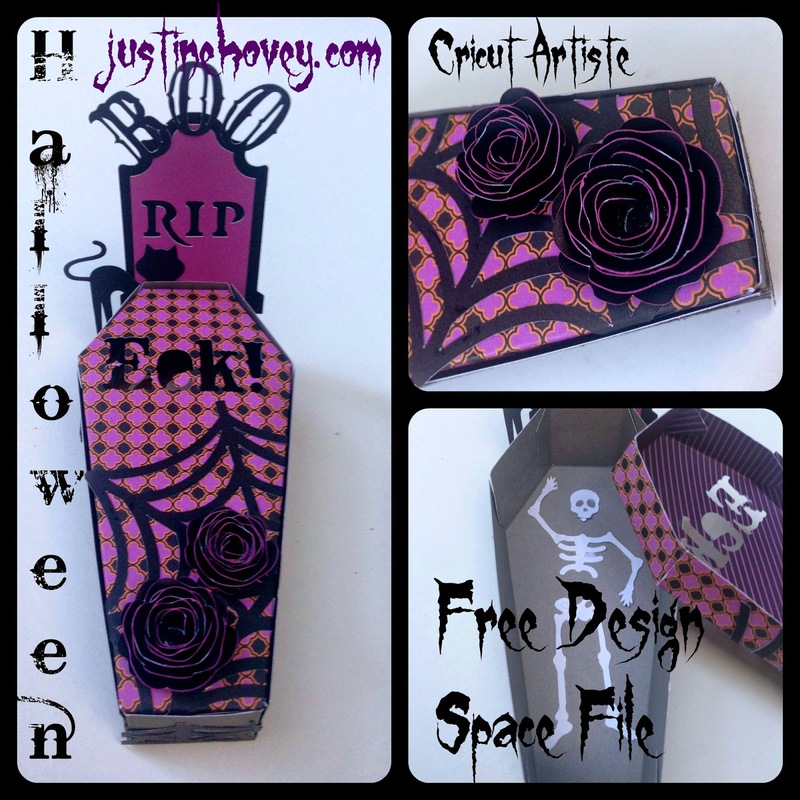 Great party favour idea for a Halloween party! 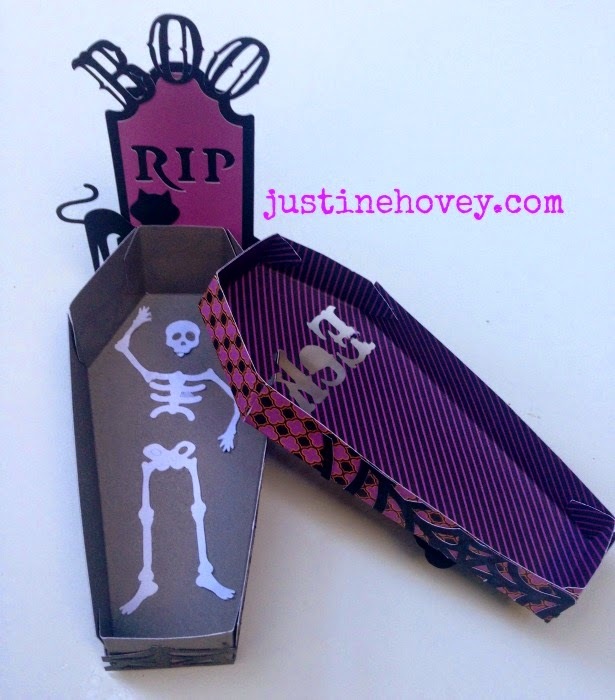 And I love the skeleton stamped in the box! Wonderful!! Im so going to make one! lol I loved the video, it makes it super easy! I love that you added the skeleton to the bottom as a surprise!! Awesome job Justine! Awesome! Love it! Thanks for sharing the file!! I love the flowers and the coffin! 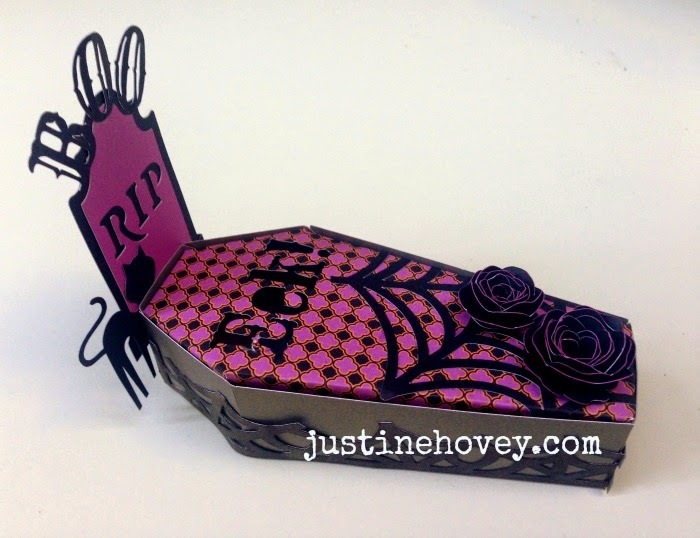 Love your coffin box - awesome! Thanks for sharing! Thank you Nancy - you're welcome! Very cute! Like to purple added to the flowers, makes them stand out even more! This is an incredible design. You can check my site design too.